As we wrote last week, PETA’s long-standing practice of euthanizing over 90 percent of the dogs and cats in its pet shelters has garnered attention from the New York Times. Apparently, we’re not the only ones who picked up on this coverage, as the Pittsburgh Post-Gazette also editorialized today on the hypocritical position in which PETA has placed itself by slaughtering the animals they pretend to protect. 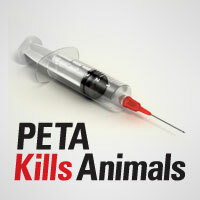 As word spreads about PETA’s high use of euthanization, the animal-rights group itself could become the subject of protest. If PETA cannot commit to the “no kill” philosophy practice by organizations in the pro-animal community, it will forfeit the moral right to speak out about others’ inhumane actions. Funny thing is, PETA already has become the subject of protests from other animal rights groups. Some of their objections were raised in a recent New York Times profile. We don’t think PETA activists will be invited to any conferences on reducing shelter pet killing anytime soon. Given the coverage PETA’s pet slaughterhouse is getting in mainstream papers, it looks like we’re not the only ones who have caught on to their tricks.